I woke up in the morning feeling slightly groggy. I groaned as I dragged myself out of bed, and immediately collapsed on the floor. I hate mornings, but I knew I had to get up. My owner makes my three sisters and I get up at 6:30 AM every morning so we won't be late to the Neoschool down the block that doesn't exist. We've learned not to ask questions. Everyday we go downstairs for breakfast by 7:00. My owner's always on the computer when we get down there. Once everyone's having breakfast, she'll throw her hands up in exasperation and yell, "They've cancelled school again? How can we get our pets a good education if we can't even send them to a decent SCHOOL?" And every day I go up to her and say, "Neoschool never existed. Neoschool still doesn't exist. Neoschool never will exist." And she'd say, "Well, it's all here on the brochure. I still don't understand why they've cancelled school every day for over 10 years though." And I'd say, "What are you talking about? What kind of brochure are you looking at?" I'd get up to take a peek at it, but she would slam it shut and hiss at me to go finish my breakfast. But as I said, we don't ask questions. Well, look what you've done. Now I've gotten off topic! Anyway, what was I talking about? Oh yeah. So I woke up at 6:30 this morning, as I do every weekday. Oh gosh. I was so busy rambling that I'm late for breakfast! I run down the stairs, or rather flop, thanks to these lousy flippers. But for some reason, today, it was a lot easier. I'll figure that out later. I finally reach the kitchen, but for once, it was empty! No one at the kitchen table shoving whatever passes as food into their mouths, no yelling teenager screaming her head off by the computer. I checked the clock next to the Neocalendar. 7:12. Did they go somewhere without me after school was "cancelled" again? Probably not. Usually everyone just goes back to sleep on weekdays, and today was, was... What day is it today? Yup, you probably guessed it folks. Happy Saturday. Flotsam don't have soft white fur. Startled, I took a look what used to be my flipper, but found a white paw, soft as a cloud. This didn't feel like a dream, though it should have. On instinct, I ran to the bathroom and cautiously peered at my reflection in the old, rusty mirror. And I screamed as loud as I could. My sister Sky, a blue Kacheek, emerged from the next bedroom sleepily rubbing her eyes with her fists. "Hey, what's going on-"
And she screamed. I screamed at her to stop screaming and we both screamed together. My other two sisters trudged out of their bedrooms with confused looks on their faces, and suddenly everyone was screaming at once. "Hey, why are we screaming-" started my sister Milly, a yellow Wocky, but stopped as soon as she saw my face. Everyone screamed some more until the neighbors next door started screaming at us to stop screaming. The word "scream" is starting to sound very strange now, isn't it? Let me just get to the point. It was hard to accept at first, but I'm just going to get it out there. I was a Halloween Cybunny. It just didn't make any sense. 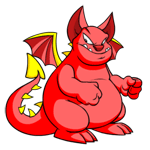 How could I have gone from a sweet snow Flotsam to one of the most terrifying Halloween pets in only one night? I looked around the room, searching for an answer in this messed up mystery. I was about to just accept everything and give up when I saw a can of paint by my door. I wasn't the LEAST bit artistic, and I didn't see Sky playing with any paint recently, so I had no idea why it was there. Until I took a look inside and saw that it was empty, accept for a large paint brush. There was no paint on it currently, but if you looked closely, you could clearly see the imprint of the faded paint that had been used: paint as black as night with two creepy eyes staring up at me. It was a used Halloween Paint Brush, no doubt about it, but why was I a Cybunny? Nothing made sense anymore. I looked up and saw my sisters watching me. I showed them the can of paint by the door, and explained the strange imprints. Sky, the artistic yet logical one, stepped forward. She loved a good mystery or two. "Well, that explains the color, but it doesn't explain your sudden new species. I just wonder..."
"What?" I asked, growing tired of her pause. "Well, the only ways for you to become a Cybunny would be to get zapped one by the lab ray, or from a morphing potion. But it would take months, even years, to be zapped into one particular species. And you've never been zapped before, have you?" "No, I think I would've known if I'd been zapped," I reply. "Besides, we all know that our owner's still saving up for the pieces to access the lab ray. And I haven't taken a morphing potion. Aren't there any other ways I could have become a Cybunny?" "Well, there are probably many other ways, all of which either extremely unlikely or impossible to do without you being aware," Sky continued reasonably. "Honestly, I don't know. Sorry, Flo." "It's alright Sky- you tried your best. I'm sure we'll figure it out," I said optimistically to my older sister. Leave it to me, the second youngest in the family, to reassure everyone. I suddenly realized that Milly, the youngest in the family, had gone oddly quiet. Heather, a speckled Poogle, was responding to Neomails that appeared in front of her the whole time, so she didn't say anything either, but Milly was downright red. It's not unusual for Milly to be quiet- she's very shy- but it was different this morning, though I wasn't sure why. Sky followed my gaze and tapped Heather, and soon we were all glaring questioningly at Milly, who looked as uncomfortable as ever in the strange silence. "What is it, Mil?" Sky asked quietly but inquisitively. "Anything you'd like to say?" She shook her head fast. Everyone slowly gathered in a circle around her, stepping closer and closer. It was kind of freaky, and somehow we all managed to step at the same time, but at least it did the trick. "Okay, okay! Just stop it you- you weirdos." We smiled at the compliment. "I'll tell you what I know. So first of all- I didn't do it- but I might have seen something. I'm not sure this is what it is- but yesterday evening, SHE put something in your drink." Our owner eventually kept changing her name so many times, that eventually we just refer to her as HER or SHE. Anyway, that may have been the most Milly's ever said out loud at once. Impressive. But I wasn't done. "Wait, wait so you're saying that she put the morphing potion in my Neocola when I wasn't looking, and that's why I'm a Cybunny? Then maybe she painted me Halloween while I was asleep..."
"I'm not saying that's for sure what it was- I'm just telling you what I saw," Milly stated quickly in a tiny voice. "I'm sorry Flo- though that name doesn't suit you as well with your new form." "We'll think of something else for you," Sky added helpfully. She nudged Heather who was answering a Neomail that just appeared with her tongue poking out. "What? Oh yeah, it'll be okay. Whoa wait- what happened to you Flo?" "Heather, did you seriously just miss that whole conversation?" "It was an important Neomail!" We all laugh for a good while, and even Heather put off her Neomails to join in. It was so nice to know that my family still accepted me, even though I looked horrifying, which I suppose it what family is supposed to be about. I was especially grateful for my sisters, even Heather, as distracted and scattered as she is. But before I turn this into some gushy life lesson about the importance of family and all of that, I'm not done. "Wait a second, I think I remember something," Heather broke in when the laughter died down. "Yesterday, when we were having dinner, I saw HER put something in your diet Neocola while we were talking. And then-"
"DIET? SHE gave me DIET?" No wonder it tasted so gross." I had to break in. "Actually, it might've tasted so gross because SHE dumped the contents of a strange bottle in your cola," Heather continued. "I took a closer look at it later when she threw it away and-"
"You dumpster dived Heather? That is SO unlike you!" "Oh don't worry, I took seven showers afterward. Anyway, I took a closer look at it and saw a few drops of yellow liquid inside, and I recognized it immediately. SHE gave you a morphing potion." Heather watched our silence and put a proud look on her face, convinced she solved the mystery. "We know." Sky was the first to speak. "Milly told us." "Oh." The bright look on Heather's face dimmed for a few seconds before returning. "But I bet no one told you this! Before we went to bed, I was about to go and talk to Sky about something, but when I left my room, SHE was there again, standing outside Flo's door with a scary-looking paint brush in her hand. Do you think-"
"No doubt about it, that's how she changed my species and color. I wonder why SHE didn't just buy a Halloween Cybunny Morphing Potion, but I guess this was the cheaper option," I reply. "As a matter of fact, I wonder why SHE didn't just TELL me instead of doing it in secret like that." I turned to Heather. "Did you see anything else? Like, did SHE enter my room?" "No, I didn't see HER go in. I don't think SHE wanted to do anything while SHE knew I was there. SHE just put HER finger to HER lips, warning me not to tell, and shooed me back into my room." "So SHE told you not to tell anyone?" Sky asked with an amused look on her face. "Nope. And I didn't. Oh, wait a second-"
We all started laughing again, louder than we were screaming. It just felt really good, after all the tension and worry of this morning. We probably laughed for ten minutes, and would've laughed for longer if my owner didn't come in to see what was going on. As soon as SHE stepped in, I turned light lightning and did my famous glare on HER, which is about twenty times more powerful in my new form. "What is this about?" I demanded. "Oh look, you're a Halloween Cybunny..." SHE tried to step back. "Wonder how that happened..."
"Oh don't play games with us. We know how it happened," I reply glaring a bit more. SHE stepped back further. "The only thing we don't know is why you didn't just tell me in the first place and save me the trouble of writing a whole story!" SHE looked confused. "Story? But I thought-"
"Nevermind that part! Why didn't you tell me!" "AWAY WITH YOU." I glared harder and SHE just screamed and ran out the door. I didn't care what she says. At least my sisters accepted me, and at the moment, that's all I cared about. So for now I'll save you from a sappy ending and just end the story now. "Wait!" HER head popped around the door. SHE was about to say something, then stopped when SHE realized everyone was watching HER suspiciously. "Umm... I'm s- sorry?" SHE stammered awkwardly. I sighed. How many times did I have to do this? "OUT," I said, glaring as hard as I could. SHE started running around the room screaming "My eyes! MY EYES!" for about five minutes until SHE accidentally tripped and tumbled out the window, screaming. We heard our neighbors screaming as SHE landed in their yard, on top of their freshly cut hedges, and soon we were all screaming with laughter. We sure do scream a lot in this family, don't we? "Okay, that's enough," I said to my sisters, smiling slyly. "In fact, I wanna see how well that works." Their smiles melted as I set my glare on them, and they started backing away. Soon, they were running all over the place, covering their eyes and screaming, as they found their way back to each of their bedrooms and double- locked the door. I smiled. I could get used to this.